Western Digital (WD) today announced that it's buying fellow data storage vendor SanDisk in a cash and stock deal worth about $19 billion. The move comes as the IT industry is evolving rapidly as companies look for ways to embrace trends such as wearables, the Internet of Things and the cloud. The result has been a recent wave of mergers and acquisitions and investment activity in the data storage market. WD's purchase of SanDisk comes on the heels of the data storage market's biggest-ever acquisition, Dell's purchase of EMC for $67 billion. That deal was announced just last week. In addition, storage semiconductor maker PMC-Sierra has received multiple takeover bids, and China's Tsinghua-owned Unisplendour has agreed to buy 15% of WD for $3.78 billion. WD, a company steeped mostly in hard disk drive (HDD) technology, faces an evolution in IT that is driving companies to address a changing set of requirements for both client and enterprise end customers. Enterprises no longer rely solely on tape drives for backups and hard drives for primary data, but must also deal with the higher speed requirements of applications such as online transaction processing and big data analytics. Today, solid-state drives (SSDs) are a critical component of multi-tiered storage infrastructures where flash memory devices sit just under DRAM as top-tier storage. 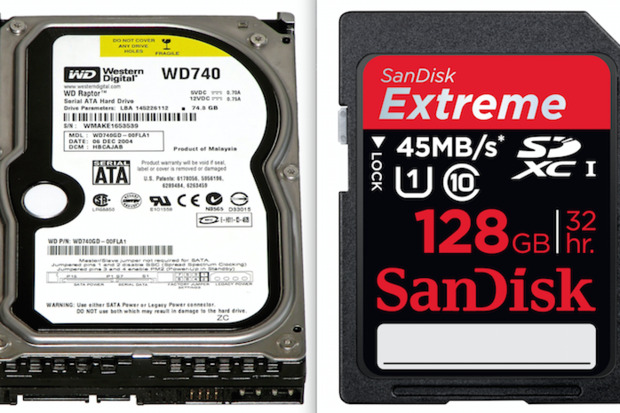 In addition to enterprise products, both WD and SanDisk are California-based companies heavily involved in different segments of the consumer data storage market, with WD offering desktop NAS drives and SanDisk operating as a leading provider of flash-based thumb drives and memory expansion cards. Earlier this year, SanDisk, also known for internal SSDs for desktops and laptops, announced its first lineup of pocket-sized, high-capacity external drives. WD's buyout of SanDisk mainly gives the company an instant foothold in the global, non-volatile NAND flash memory market, according to Jeff Janukowicz, research vice president at IDC. "Additionally, the NAND industry is at an infection point as it transitions from planar to 3D technology and access to that technology was a key piece of the deal," Janukowicz said via email to Computerworld. "Now, WD is positioned to address a much larger footprint in the storage industry." WD itself noted in its announcement about the deal that the combination will "enable it to vertically integrate into NAND, securing long-term access to solid state technology at lower cost." SanDisk, which has 27 years of experience in the NAND flash memory marketplace, recently announced a deal with leading flash maker Toshiba to manufacture the world's densest 3D NAND -- a 48-layer, 32GB chip that offers twice the capacity of the next densest memory. 3D NAND represents the most advanced memory product to date, achieving far greater capacities at lower productiion costs by stacking layers of NAND flash cells atop one another like microscopic skyscrapers. All major producers of flash products have announced their own versions of 3D NAND, some denser than others. Intel announced yesterday that it will convert its fabrication facility in Dalian, China, from making processor chips to making 3D-NAND flash chips. Intel also plans to invest up to $5.5 billion in its 3D NAND project. The Dalian fab plant is scheduled to begin producing memory chips in the second half of 2016. In its acquisition announcement, WD singled out the 15-year partnership between SanDisk and Toshiba, stating that it expects that relationship to be "ongoing." "The [joint venture] provides stable NAND supply at scale through a time-tested business model and extends across NVM technologies such as 3D NAND," WD said. While the WD and SanDisk data storage product portfolios do overlap slightly in that both companies sell enterprise SAS-based and PCIe-based SSDs, in general, the buyout will increase the addressable market and provide revenue diversification for WD across multiple technologies and market segments, Janukowicz said. Gregory Wong, an analyst with Forward Insights, said the deal allows WD to enter the consumer SSD and enterprise SATA SSD market. "WD wants [SanDisk] for the access to the flash. Their PC HDD business is declining due to the weak PC market but also because SSDs are encroaching that space," Wong said. "Without access to NAND flash at cost, it would've been difficult for them to participate in that space and also would've increasingly been difficult to compete with NAND players in the enterprise space." The NAND flash market grew rapidly over the past decade, but in the past few years, it has consolidated and growth has slowed because it can't support the many players. Because there's little product overlap, the WD-SanDisk merger doesn't really add much in the form of market consolidation, Wong said. "With this transaction, Western Digital will double its addressable market and expand its participation in higher-growth segments," Wong said. WD said that Steve Milligan will serve as CEO of the combined company, which will remain headquartered in Irvine, Calif.